Thanks to its dual action technology, this fluid improves skin firmness, reshapes facial contours and prevents sagging looking skin. THPE contracts skin cells for a measurable lift. Bugrane extract stimulates the production of elastin to help maintain the long-lasting lifting effect. This ultra-hydrating formula, helps fight skin ageing. Its fluid, light texture penetrates rapidly. Used daily, skin is visibly firmer, facial contours appear as redefined and the oval of the face is like redrawn. Your skin regains its softness. Apply daily, on face and neck.Ideal to apply in the morning, as a day care. This fluid acts as a very good base for make-up. 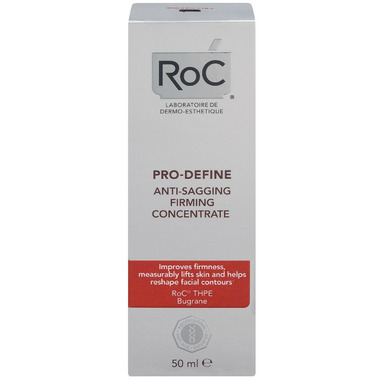 Can be used alone or in complement of another RoC facial skincare for a personalized anti-ageing daily regimen. THPE contracts skin cells2 to tighten and redefine facial contours. Bugrane extract stimulates the production of elastin2 to firm skin. Glycerin intensely hydrates the skin for a softer touch.